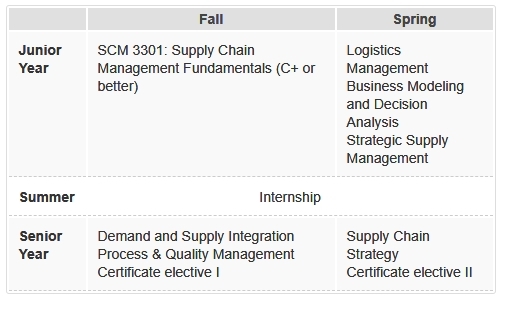 Note that to complete their degree requirements students only need to take any two electives from the list specified in the undergraduate catalog. In other words, students do not need to earn a specific certificate to graduate, they only need to complete the 6 hours of additional SCM electives. Strategic sourcing specialist - Determines best sources of supply for most purchases. Negotiates prices, quality requirements and delivery terms and conditions. Logistics coordinator - Designs or improves logistics processes in an effort to improve service or reduce operational costs. Makes recommendations regarding warehouse operations, delivery options, and transportation strategies. Process improvement specialist - Facilitates implementation of process improvements. Provides business input to improve system performance and delivery. Material planner - The material planner plans and schedules work through the manufacturing facility to meet the on-time delivery schedule and cost target commitments. Enterprise systems analyst – Responsibilities include assessing business needs and formulating solutions through the use of ERP and other applications and initiating and leading related projects. Business data analyst – Interprets business performance results using a variety of techniques, ranging from simple data aggregation to complex data mining. Designs, develops, implements and maintains business solutions, and provides access to information in the form of data extracts and dashboards. Joining one of the Bauer College of Business student organizations provides students with leadership and professional development opportunities, social activities, and lifelong friendships. Organizations bring in distinguished leaders to share their insights and experiences, organize mentoring opportunities with professionals and upperclassmen, and much more!